First some generalizations, then a detailed case study. In some cases the answers are very easy to know how animals moved to places far away from the region where Noah landed, because we have records of recent arrivals downunder in Australia. Cows, sheep, goats and other domestic animals got to Australia by boat with the British in the 1800’s – along with pesky rabbits and foxes. In the same way many animals would have accompanied people as they spread out over the world since the flood. Other creatures were quite capable of spreading out by themselves. Parrots and other flying creatures winged their way around the planet since neither mountains nor jungles are any hassle to wings. But when flying creatures lose their wings, they actually do devolve into species such as the flightless ground dwelling Kakapo parrot on the South island of New Zealand. From then on they are doomed to permanent residency and/or extinction once bird eating dogs, cats, ferrets and rats arrive. Flying insects would also have been aided by post-flood climate change, as new wind and hurricane patterns butchered the weather, but enabled such tiny creatures to often travel amazingly large distances. And sometimes degenerate loss has left some of their descendants flightless and island bound. Some very small creatures, such as insects and other invertebrates, have been found to also hitch rides over oceans clinging to birds’ feet or feathers. We also now know the answer to how some lizards such as iguanas and other small creatures got to remote and fairly recently formed oceanic volcanic islands such as the Galapagos as well as remote Caribbean islands. They floated on logs! The cases are documented. Some New Zealanders are therefore genuinely worried that Australian ‘nasties’ will one day finally make their way some 3,000 kilometres east across the Tasman sea if a fortuitous tree branch or raft of vegetation washed out to sea during our flood season bearing an Aussie snake or goanna, and will make finally make it to Kiwi land. We know how rapidly animal life can arrive on a previously uninhabited island through a modern example that has surprised many. and whose documentation is undeniable. It is the volcanic island of Surtsey some 200km off the south coast of Iceland. It first erupted 1963/4 and has provided good examples of just how many creatures great and small, can migrate across sea barriers without any human help at all. The summary of 40 years of details below, has been extracted from the many observer websites and is worth a read. Surstey began life as bad smells, minor quakes and eruptions during early November 1963 and by January 30, 1964 it was an island some 174m above water level. Soon after birds begin to arrive, and by May 1964 the first insect arrived – a fly. Shortly many flying insects had arrived via their own wings and favourable winds. Some were carried with northerly winds from the nearby Vestmannaeyjar (Westman Islands) 23 km or from the Icelandic mainland 200km away. Yet spiders also came gliding on winds from distant Europe over 1000km away. Having watched spiders ‘fly’ like this, I still find it hard to believe, but I know it’s true, and in the early morning light it’s a beautiful sight as a gentle breeze nudges branches and suddenly the sky fills with silvered strings as thousands of spiders launch into the wind, kiting their legs and soaring via mysterious wind catching silken tails. Many insect species arrived on Surtsey via the sea surface. Creatures, both dead and alive, have been found on the beach after being washed ashore, some transported on floating grass turfs with soil, or via driftwood that stranded on the beach. In addition, birds also carried small creatures to the island. However few insect species have become established. On August 19, 1966 new eruptions began but ceased in June, 1967 which allowed birds to begin breeding. Two Black Guillemot (Cepphus grylle) nests and a Fulmar (Fulmarus glacialis) nest were discovered by 1970. The Great Black Backed Gull had nested 1974, and by 1975 the new nester on the block was the Kittiwake. By the late 70’s and early 80’s, Surtsey could be classified as an Island community of herbivores, carnivores plus bacteria, fungi and other saprotrophs (organisms that feed on dead and decaying matter). Plants have also become established. By the mid-1980s there were flowering plants such as the Crowberry (Emperium Nigrum), the Meadow Buttercup (Ranuculus Acris) Smooth Meadow Grass (Poa Pratenis), Bening’s Tufted Hairgrass (Deschampsia Beringensis) and the Northern Dock (Rumex Longifolius). In the Summer of ‘93 of the first earthworms (juvenile chestnut worms) were found in soil samples taken from the gull colony, but they have not been found since. During the summer of 2003 the Northern Green Orchid (Planthera Hyperborea) and Lady’s Bedstraw (Galium Verun) were found, along with 53 species of moss. In 1994 a special fungus Onygena Cervina, whose only essential nutrient need is keratin was discovered in feather remains. Then in 1995 eight species of Colomba (pigeon) were found, six were new to the island. 62 different species of mites had arrived and the vegetation had become very lush and soil fauna diverse. During 2002 a total of 76 invertebrate species were found on the island. Flying insects are the most conspicuous in the fauna, but there are already wingless species such as Ceutorrhyncus insularis, a very small snout beetle that feeds on scurvy grass, and is an extremely rare species on a global scale. Surprisingly two land snail species have been found: the Western Glass-snail (Vitrina pellucida), and the slug Deroceras agreste. In addition, 10 species of Linyphiidae (small spiders) have been found in Surtsey, six of them in 2002. Dwarf Willow (Salix Herbacea) has appeared and is the first willow to occupy Surtsey. Now in 2016, all we need are some rats and cats to arrive and it could become a fully-fledged microcosm, but it may not last for long. Sadly the sea is reclaiming the island rapidly, and it has lost half its area since eruptions ceased, but it has been a real window into the migration abilities of plants, birds and insects across a sea barrier. Further studies of more permanent emergent volcanic islands such a New Guinea’s Long Island, 55 km north of Papua, which was volcanically sterilized in the seventeenth century, show the island has been recolonized by land animals proving that all types of land vertebrates, including mammals, are not far behind the birds and bats. There is one last statement we can add to this: all creatures got off the ark with limited populations after the flood, i.e. a minimum of 2, or a maximum of 6. (see Genesis 8 & 9) They de-boated onto a world where large jungles forests etc. were yet to re-establish, so apart from erosional canyons, rivers, plus newly forming or uprising mountains and seas to cross, there wasn’t much to hinder them. Since God instructed Noah to wait several months after the waters began to recede before he unloaded, the ground would still have been moist and covered with freshly sprouted plants for food. As a result of this abundant ground moisture there would also have been no vast tracts of deserts to prevent migration. Today’s extremely arid areas such as the Sahara, Arabia, and outback Australia show abundant evidence of having originally been lush with flowing rivers, sustaining quick growing plants such as grasses, herbs and shrubs, and providing plenty of food and shelter to sustain small groups of migrating animals. Without either dense jungles or empty deserts migration would be much easier that it is today. Flood debris was probably abundant for decades after the flood, but for any who couldn’t hitch a ride, walking across land bridges was the way to go. In these days of concern about changing ocean levels due to climate change, land bridging takes on a new importance. It’s very easy to go online and check what would happen if water levels decreased changed by factor x and see the result worldwide. Run a check on these programs and enter ‘drop sea levels 100 metres or 300 feet’. You will discover that both people and animals could walk from the Shetland Islands to the tip of South America without getting their feet wet. On top of that there is abundant evidence of sunken beaches, drowned rivers and tree stands under the ocean to that depth. The one previous climate change that would have brought about such large post-flood changes in sea levels, was the ice that came after the flood and gets a first mention in Job 6. Yes, even the Eskimos could have walked to Alaska from Asia, and Aboriginals from India to Australia, along with many otherwise land-bound creatures. Follow that with a little global warming, inducing glacial melting followed by sea level rise, and populations became cut off until explorer Captain James Cook in the 1700’s, became the first European to meet many previously unknown (to him) races, and see what are now called ‘indigenous’ species of creatures. All of this means accounting for post-flood migration of animals or people around the planet after they leave Noah’s Ark is not actually very difficult at all. 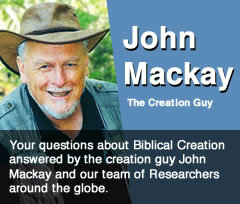 Creation Research DVD Climate Change and Creation. Available from webshop. Preview here.